Synopsis: On a foggy night in London, police are on the lookout for the notorious serial killer Jack the Ripper, who has already claimed three victims in the seedy neighborhood of Whitechapel. Despite the heightened police presence, the killer strikes again. One woman claims to have seen a man fleeing the scene of the crime, but she did not see his face. Later that evening, the newspaper special editions hit the streets, and people eagerly come out from their homes to buy the latest news. One of these people is Robert Bonting, a down-on-his-luck investor whose wife Ellen has decided to let out one of the rooms in the house until their fortunes recover. A man arrives in response to her advertisement: a tall, hulking doctor who calls himself Mr. Slade, who rents the room on the spot after only the most cursory look at it. He tells the Bontins that he tends to keep odd hours, and he insists on using the back door to the house to enter and exit. He also avidly relates to Ellen some Bible verses related to the dangers of wanton women, and he tells her that the worst types are women of the theater. His own brother, he relates, was ruined by such a woman. Ellen tells him that her own daughter is performing in a music hall show, and that when he meets her, she will surely change his mind about the bad sort of women who perform in the theater. Comments: This very handsomely photographed thriller features Laird Cregar as the mysterious Mr. Slade, and the lovely Merle Oberon as Kitty. 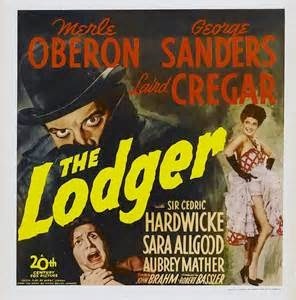 The Lodger has been adapted for the screen a number of times (most famously by Alfred Hitchcock in a silent version); but this by far the best known of the sound-era versions. Unfortunately, The Lodger is hobbled by a couple of serious deficiencies. The first is a structural problem in the story itself: the film wants us to get caught up in the question of whether or not the mysterious lodger is in fact the Ripper. But Mr. Slade is so obviously loony and hostile to women that there's virtually no suspense to be found. The story would have worked better by offering more in the way of misdirection. We get one good scene of this kind when Emily notices that Slade has hidden his Gladstone bag after newspaper reports suggests that the Ripper carries one. But when she goes to Robert with this information, Robert defends Slade, saying that many men carry such bags, including himself -- and then he shows her a Gladstone bag that he himself has hidden, fearing that he will be mistaken for the Ripper. The movie might have played on our suspicions that Robert Bontin himself might be the Ripper, but this possibility is never pursued, and we never have reason to believe that anyone but Slade is the culprit. 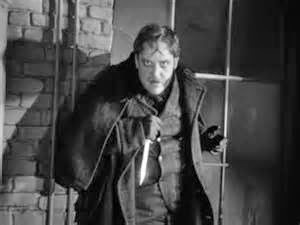 The other major problem, unfortunately, is Laird Cregar's performance as Slade. Cregar's imposing physicality as an actor goes a long way, and his bulgy-eyed, over-the-top portrayal becomes unintentionally comical. Cregar doesn't deserve all the blame for this; director John Brahm should have recognized the problem and had Cregar dial his performance down. 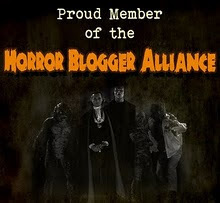 Nevertheless, the supporting cast does just fine. 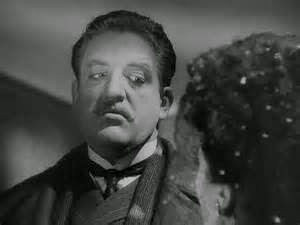 Merle Oberon is a captivating presence, Sara Allgood gives a smart turn as the worried Ellen and Cedric Hardwicke delivers an unusually wiggy performance as Robert Bontin. And that old smoothie George Sanders is a welcome presence in any film. Synopsis: It's close to midnight at the state penitentiary, where an execution is due to take place. The executioner Ernie Matthews is beside himself with anguish and self loathing. He hates the idea of killing someone at the State's behest, even if it is a notorious murderer of women. Bob, the prison doctor feels bad too, but understands that they must all do their jobs. Anyway, that's what Bob tells nurse Joan, who is also distraught about the pending execution. He tells her that once he's back from his month-long vacation in Bermuda he will look for another job -- one in a pleasant small town. And when he finds that job he will ask Joan to marry him. But Joan is undecided. She likes Bob but is reluctant to give him an answer. At midnight the execution takes place. Joan is to take Bob to the airport, and Ernie cadges a ride to a nearby bar to drown his sorrows. The warden asks Johnny Martin, a trusty who is about to be paroled, to drive the car. When they leave, prison pastor Ira tells the warden that he's in love with Joan, but she isn't aware of it; as long as she shows a preference for Bob, he will keep silent about it. But he tells the warden that Ernie is in love with Joan too. "He told me months ago that the only reason he remains here is to be near Joan." "Am I running a prison or a lonely hearts club?" the warden wonders aloud. Ernie gets dropped off at the bar, where he meets Manning, a loud-mouthed reporter who had covered the execution. The two get into a fight that turns into a full-on barroom brawl. Meanwhile, Joan has dropped Bob off at the airport, and decides to go back to the bar and check on Ernie. Johnny enters the bar to find him and tries to break up the fight. Johnny gets a few punches in, but ends up getting cut in the neck by a broken bottle. This lands him in the prison hospital where Joan tends to his wounds. She finds herself charmed by Johnny's aw-shucks attitude. She asks him what he's in prison for, and while he hints that he's innocent, he doesn't claim to be; after all, that's what all the other guys in stir do. No, he says, he's just the kind of guy who ends up in the wrong place at the wrong time. that Johnny's parole will have to be delayed for at least a year, until the scandal blows over. Comments: Romantic love doesn't usually figure prominently in prison movies, so in that regard at least Buried Alive stands out from your standard issue film of this type. Joan isn't the only woman on Earth but she might as well be, given the attention that every man around gives to her. Like a lot of the quickly-penned programmers of this era, you get the odd feeling that Buried Alive was written by people who had no first-hand experience in human relationships. The cavalcade of men who are vying for Joan's affections becomes unintentionally funny. It would be easier to list the men in the movie who aren't in love with her. Everyone's attitude toward capital punishment seems odd as well. People who work in prisons - especially prisons where executions are carried out -- become hardened to what they experience every day; they find ways to compartmentalize emotions like pity and empathy. They have to do that in order to carry out their jobs and maintain their sanity. But everyone who works at the prison in this movie seem to be deeply troubled by the prisoners' lot and extremely upset at the idea of the executions that were, in this era, all too routine. Why would Ernie, the state executioner, constantly wail and agonize about the morality of his job? The explanation we're given - that he sticks with it because he wants to be near Joan - doesn't make a lot of sense. Why, after all, did he take the job in the first place? In fact, everyone in the movie seems to be against capital punishment as a matter of principle, with the exception of the cartoonishly slimy Manning. Little that happens in this movie is remotely plausible, and plot contrivances pile up like cord wood. The entire trip to the airport is cooked up so that we can get Johnny, Ernie and Manning in the same bar on the same evening. And what kind of airline schedules flights to Bermuda at two in the morning? 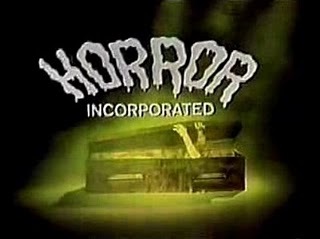 I know what you're thinking: a forgotten 76-year-old movie that was broadcast on a medium-market TV station in the middle of the night 43 years ago? Who cares? Well, I can't help it. I do care. And I always will. I've never been big on THE LODGER, nor its 1954 remake MAN IN THE ATTIC, starring Jack Palance (makes you wonder how Hitchcock pulled it off). Come to think of it, I wasn't too impressed with HANGOVER SQUARE either. 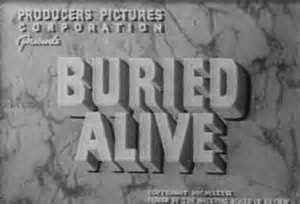 From the Poverty Row company soon to become PRC, BURIED ALIVE has remained elusive to me, though had it played in Pittsburgh, I definitely would have seen it!